This gift card can only be used in-store. 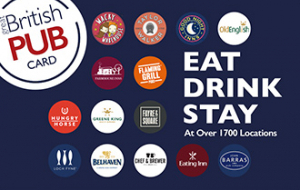 The Great British Pub e-gift is a digital gift code that can be redeemed against food and drink in over 750 pubs nationwide, including the brands Chef & Brewer, Hungry Horse, Fayre & Square, Loch Fyne Flaming Grill and Belhaven. Alternatively, you could treat the children to a play in your nearest Wacky Warehouse.The Great British Pub e-gift is flexible, convenient and offers a choice of dining and drinking options and experiences.It’s perfect for families, couples, or for going out with your mates. To spend your Great British Pub Card e-gift, simply print off your email and present at point of payment for food and/or drinks in any of our participating pubs. Alternatively, you can present the email on your smart phone. This Great British Pub Card e-gift can be used until fully redeemed. Once the funds have been fully spent it can no longer be used. For any card queries or problems, please ring 08435 064 006 (Mon-Fri, 09:00-17:00). Any company, partnership, individual or other legal entity ("you") purchasing the Great British Pub Card ("Card(s)") from Spirit Pub Company Plc. trading as Great British Pub Card ("us" or "we", as applicable) does so subject to the conditions of use set out below, together with the General Terms and Conditions (www.greatbritishpubcard.co.uk/terms-and-conditions/), and any conditions on the Card Carrier ("Terms"). Use of the Card constitutes acceptance of these Terms. Under the Distance Selling Regulations, you have a right to cancel Cards purchased by phone or online, via email or SMS, and receive a full refund. To cancel email us at:www.greatbritishpubcard.co.uk/contactus at anytime after placing your order and up to 7 working days, commencing the day after delivery of the Card. You must take reasonable care of the Card and return it to us. Once activated the monetary value on the Card can be used as full or part payment in any participating pub restaurants. The list of participating pub restaurants is available online at:www.greatbritishpubcard.co.uk/ourpubs; the list of participating pub restaurants may change from time to time, please check our website for details. When you use the Card, the cash balance on the Card will be reduced by the full cash value of the purchase. If the amount of the purchase is greater than the available balance on the Card you may pay the difference. To upload money onto the Card, you must be aged 14 or over and resident in the UK. The purchase of certain products and services using the Card are subject to age requirements specified by law. We are not permitted by law to supply these products or services to individuals who do not satisfy these age requirements and, if you are underage, you must not attempt to use the Card to purchase these products or services. The monies on the Card cannot be exchanged for cash but the balance may be used for future purchases, subject to paragraph 10. You may only redeem the Card in GB pounds sterling. All monies on the Card must be used by the expiry date, which is 12 months from the date of purchase. Any balance left on the Card after the expiry date will be forfeited and cannot be refunded. You should treat the Card as you would cash, we will not be held liable for lost, stolen or damaged Cards and we will not replace the Card. The Card is transferable by delivery. We will assume that the person who uses the Card is the rightful user of the Card. We will not be responsible for any unauthorised use of the Card. The Card is not a credit, debit, cheque guarantee or charge Card. Cards can be purchased with a minimum value of £5, up to a maximum of £250. The maximum value to be stored on the Card is £250. You cannot transfer the balance on the Card onto another Great British Pub Card. We reserve the right to refuse to accept a Card or to limit the use of a Card which it deems to have been tampered with, duplicated, damaged or which otherwise is suspected to be affected by fraud, misconduct or unauthorised use. If we suspect fraud, misconduct or unauthorised use of the card we reserve the right to cancel or withdraw the card. The card will become invalid once cancelled and you will not be able to redeem the balance on the card. Email and SMS cards are valid when presented on a smart phone or printed out. You may not resell Cards to a third party. Cards will be sent to the delivery address stated on each individual order and will be dispatched on receipt of cleared funds. If we fail to receive payments from your bank or card company we will cancel the value of the card. Delivery charges may apply please see:www.greatbritishpubcard.co.uk/delivery/ Cards cannot be returned or refunded, except in accordance with your statutory rights or as prescribed under the Distance Selling Regulations. If you have purchased Cards from a third party please refer to the additional terms and conditions that apply at www.greatbritishpubcard.co.uk/termsandconditions We reserve the right to amend these Terms at any time or withdraw the Card on reasonable notice; such changes will be posted on:www.greatbritishpubcard.co.uk/termsandconditions. Your statutory rights are not affected.